Carl Frederock, a.k.a Carl Bunch, is now charged with DUI for a second time. This time he also faces homicide by vehicle charges accused of leaving a deadly hit-and-run crash. 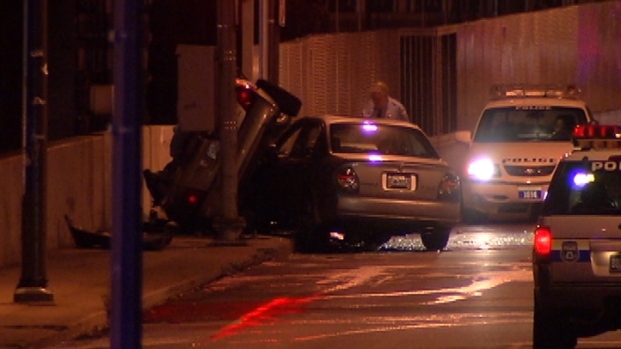 A Philadelphia judge arraigned a 30-year-old West Philadelphia man, who was already accused of DUI, early Wednesday morning on charges that he was driving under the influence during a deadly hit-and-run crash about 24 hours earlier. Carl Frederock, a.k.a. Carl Bunch, was driving his 2003 Nissan off the eastbound ramp of the Schuylkill Expressway onto the Spring Garden Street Bridge just after midnight early Tuesday when he struck Sandra Lee's 2004 Nissan, according to Philadelphia Police. Cops say Lee, 52, of 700 N 37th Street, was a passenger in her car as her husband drove when Frederock's car hit them. Lee died at the hospital about 30 minutes later, her husband survived the wreck with minor injuries. Police say Frederock ran from the wreckage on foot. They eventually caught up to him at 35th and Lancaster Streets. Police are ready to charge the West Philadelphia man they say killed a woman and injured a driver when he broadsided their car on the Spring Garden Street Bridge overnight Tuesday. A judge arraigned Frederock on homicide by vehicle, homicide by vehicle while under the influence, not having a proper license, involuntary manslaughter and DUI. He also faces simple assault and reckless endangerment charges, according to court records. Frederock, of the 800 block of N 66th Street, was arrested back in August on another DUI charge. He was released on his own recognizance in that earlier case and was scheduled to go to trial later this month, according to court documents.